The borders of the district were very similar to those of the traditional County Fermanagh, containing all of that county plus a small section of County Tyrone in the Dromore Road (Irvinestown ward) and Kilskeery Road areas. Council headquarters were in Enniskillen. Fermanagh District Council was a unique local authority in that it covered at least one entire county in Northern Ireland. County Fermanagh makes up one eighth of Northern Ireland’s land mass, and the district council represented the largest local government district in geographical terms in Northern Ireland. One fifth of the area is covered by water, largely Lough Erne. The county has a population of just under 62,000, up 7% since 2001, of which 70% live in rural areas. 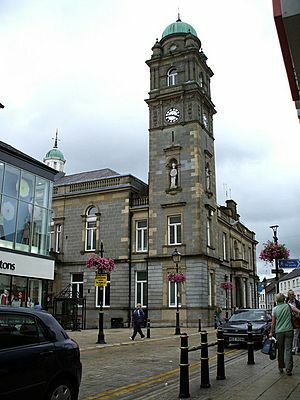 Enniskillen is the main centre of population with 13,000 people. Smaller towns in the area include Lisnaskea, Irvinestown, Belleek, Belcoo and Derrylin. The elections of 1973 produced a dead heat with 10 Unionists and 10 Nationalists elected. For a while it looked as though Unionists might gain a majority due to an elected independent nationalist John Joe McCusker being ineligible, however in the end he held his seat. The deadlock raised the prospect of the British government having to intervene as both opposing blocs could not agree on the election of chairmen. Eventually however a compromise was reached for the next four years. Nationalists gained control of the council in 1977 with an 11-9 advantage. However this came to an end with a Unionist gain in 1981 which restored the previous 10-10 balance. The elections of this period saw many smaller parties winning seats. On the Nationalist side Unity equalled the Social Democratic and Labour Party (SDLP) with four seats in 1973 although this had declined to two seats in 1977. Their successors, the Irish Independence Party became the largest Nationalist party in terms of votes in 1981 and won four seats. Boundary changes came into effect for 1985. Previously the council had five electoral areas each of which elected four councillors. A change in legislation meant that it was no longer permitted to have four member electoral areas and thus despite an increase in the number of wards to 23 the number of electoral areas was reduced by one. Since then, Fermanagh District Council area has consisted of four electoral areas: Enniskillen and Erne East, West and North. The Council is therefore made up of 23 Councillors elected every four years. The area had been a major growth area for Sinn Féin in the four years proceeding the council elections of 1985 with the victories in Westminster by-elections of Bobby Sands and Owen Carron (although they were technically elected as Anti H-Block candidates with Sinn Féin backing). Carron was one of five assembly members elected for Sinn Féin in October 1982. The party was further boosted by the defection of sitting independent councillor JJ McCusker in 1984. A former SDLP councillor Tom Murray who had lost his seat as an independent in 1981 was also an SF candidate in 1985. Consequently Sinn Féin made a major breakthrough winning eight seats in 1985, almost wiping out the Irish Independence party who lost three of their four seats. These gains gave Nationalists a 13-10 advantage over Unionists. The Cenotaph bomb of 1987 had a significant and negative impact on the Sinn Féin vote as it took it 16 years to return to 1985 levels. In the 1989 elections their representation was halved to four seats. Crucially they lost two seats to the Ulster Unionist Party (UUP) giving Unionists a one-seat majority on the council, which they retained in 1993. Nationalists were expected to regain control of the council in 1997 but ultimately could only gain one seat from Unionists. This left the council deadlocked with 11 Unionists and 11 Nationalists with an Independent Socialist (formerly Workers' Party) councillor, Davy Kettyles, holding the balance of power. Nationalists finally regained control in 2001 with 13 seats against nine Unionists and one Independent. They consolidated this lead in 2005 when the SDLP gained the seat vacated by the independent who did not stand again. At the last election in 2005 the members elected were from the following political parties: nine Sinn Féin, five Ulster Unionist Party (UUP), five Social Democratic and Labour Party (SDLP) and four Democratic Unionist Party (DUP). The Chairman of the Council is Councillor Stephen Huggett from Sinn Féin and the Vice-Chairman of the Council is Councillor Cyril Brownlee from the DUP. Under the Review of Public Administration (RPA) the Council was due to merge with Omagh District Council in 2011 to form a single council for the enlarged area totalling 2829 km² and a population of 105,479. The next election was due to take place in May 2009, but on 25 April 2008 Shaun Woodward, Secretary of State for Northern Ireland announced that the scheduled 2009 district council elections were to be postponed until the introduction of the eleven new councils in 2011. 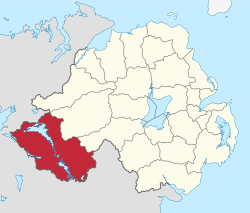 The area covered by Fermanagh District Council has a population of 61,805 residents according to the 2011 Northern Ireland census. Fermanagh District Council Facts for Kids. Kiddle Encyclopedia.